Here are two fancier wraps that I’ve been experimenting with, both with the same pin! 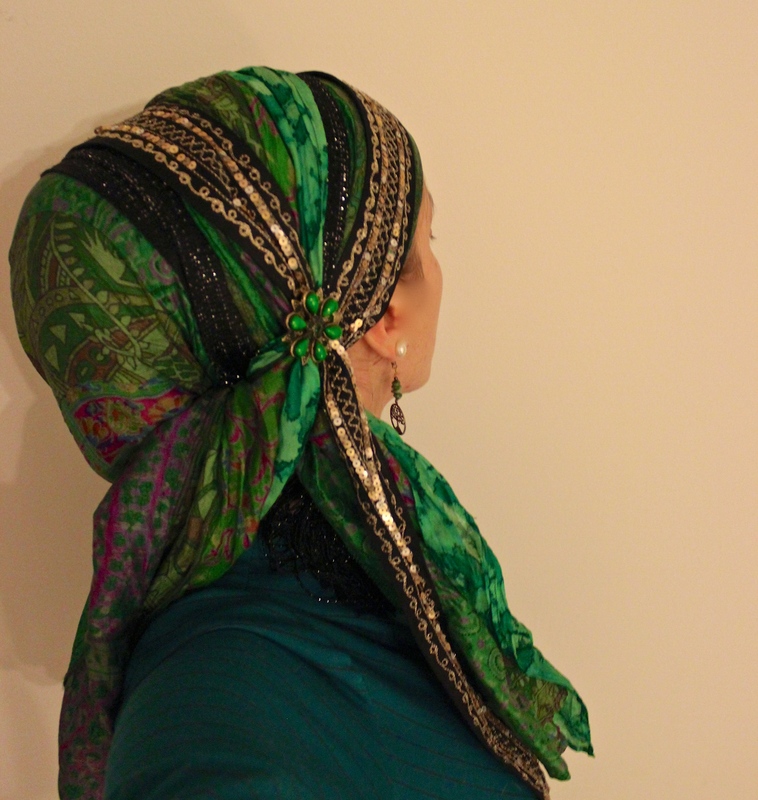 The first is using a sari scarf and a very thin Israeli tichel underneath! The second was using a green silky scarf and some black, sparkly sashes that I simply love! It was a new discovery to see how the pin secured everything together! Oh I bought that pin; I just love it! Gorgeous! I’ve been trying to work more pins into my wraps! Love this wrap, can you make a video please. This is wonderful. I love the gorgeous green and black sash. Very nice. Beautiful love the selections of tichels and colors. It’s wonderfull, but I am wondering how you did the green one… Could you post a “how-to video” to show how you organize the sashes so well, please? I especially love the colors on the first one shown! Would love 2 things! A tutorial for both, and if you could please sell these as one of your tichel kits!!! It would be really helpful for those of us new to this beautiful way of covering your hair! Andrea can you show us how you did this green/black/gold wrap? It looks amazing! I would like to use pins/brooches but I’m not sure how you did this one. Very elegant. Pingback: Post Shabbat Tichel Snap! | Wrapunzel ~ The Blog!